Aussie Golfer went along to the Callaway Performance Center to find out exactly what is involved in getting fitted for a new set of golf clubs. I wasn’t really sure what to expect at the Callaway Performance Centre. I’m a little naïve when it comes to golf equipment and only really swat up on the specs and details when it comes time to get a new driver or a new set of irons. Little did I know how much I’d learn about golf clubs and unexpectedly, my golf swing. I’m no Luddite but I was blown away by the technology Callway use to analyse your golf swing. The large support that holds the high-tech cameras hangs over you like something out of War of the Worlds. It fires out a flash of light as you make contact to take ball and club measurements, and requires some initial concentration to ignore the light and just make your regular swing. Once I’d grown accustomed my position in the spotlight, Callaway fitting expert Nathan Page had me hitting golf balls while he closely monitored the numerous bits of information popping up on the computer nearby. Ball speed, head speed, attack angle, launch angle, back spin, side spin; all providing the information needed to zero in on the perfect set of Callaway clubs I need for that ever elusive, perfect round of golf. Nathan’s got a pretty tough job in some ways. He’s fitting golf clubs for golfers with less than perfect swings so it’s important that the lie angle, shaft and club model are right for the swing he’s presented with. I got to know quite a bit about my golf swing and more importantly, the reason for my stock “bad shot”. In short we homed in on the right shaft and lie angle I need for my irons and got a lot of good feedback on the ideal driver as well. Some of the information on a range of different six iron’s I was hitting is seen in the table below. Using the RAZR X irons we played around with different shafts, lie angles and club length to create the optimal combination of carry, ball spin and shot dispersion. The whole narrowing process was fascinating and you can see my shot dispersion in the image above for a few different club combinations I used. It was also nice to hear that my stock bad shot (fat and right) is not all my fault! * For my swing, I need the lie angle increased slightly to stop the toe of the club digging in, the club face opening up and sending the ball short and right. But what about you? How can you get fitted? Firstly, fitting is what the Callaway Performance Center is all about. You can be fitted for irons, hybrids, driver and even putters, but you won’t be able to purchase them through the center. You or your golf club will be presented with the results that pinpoint exactly what clubs and specifications you need which you can then purchase through a golf store or back at your home club. If your golf club sells Callaway equipment, chat to your local pro and they will be able to line up a session at the Callaway Performance Center for you. Otherwise, you’ll need to pay for your time at the center and take the details away with you to purchase elsewhere. To purchase a set of golf clubs without being properly fitted is just asking for trouble. The Callaway Performance Center is the perfect way to get the clubs you need for your golf swing and I can’t recommend the experience enough. Who knows, you may even see a few of your bad shots disappear from your game. Check out the Callaway Performance Center website for more details or call: (03) 9212 9400 ext 6. 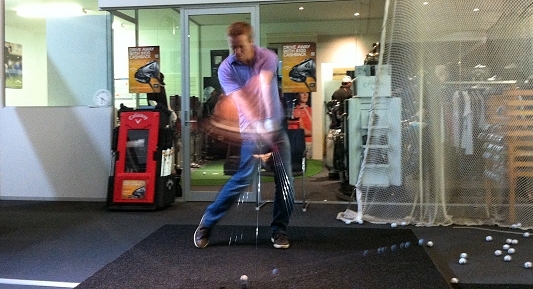 Aussie Golfer was a guest of the Callaway Performance Centre in Alexandria, Sydney. * Yes, I realise it is my fault. Who else’s could it be? the questions is, will Callaway actually be able to build the clubs to the same precision with which they can fit them? out of curiosity, when they deliver your new clubs can you take them to an independent fitter and have the angles measured? also have the flex of every iron shaft measured for consistency across the set. i would be keen to know if they build them as good as they fit them. Nice one. I have a set of Callaway Razr X tour irons with True temper stiff shafts, not fitted to within an inch of my life but have definitely improved my game!